Chef Masaharu Morimoto is teaming up with Patina Restaurant Group to open Morimoto Asia as Walt Disney World Resort brings to life Disney Springs, an entertainment-dining-retail district re-imagined from Downtown Disney. To open in summer 2015 at The Landing, in the heart of Disney Springs, Morimoto Asia is the Japanese master chef’s first pan-Asian dining experience. Morimoto Asia’s extraordinary, 36-foot tall, two-story layout includes a vast range of areas to explore including open terraces, grand hall, private rooms, long bar, cocktail lounge, waterside seating and more. The restaurant is being designed by STUDIO V Architecture. Did you do Pasadena Raymond Hill Mortuary. Even better than last year! More interactive and super fun! It sounds like you’re having a great Halloween season, just like we are! 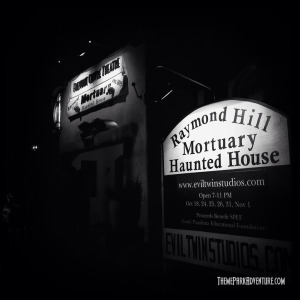 Yes, we visited our friends at Raymond Hill Mortuary in South Pasadena. Evil Twin Studios knocked it out of the park this season, and we can’t wait to share our review, images, and video clips with you in the weeks to come! 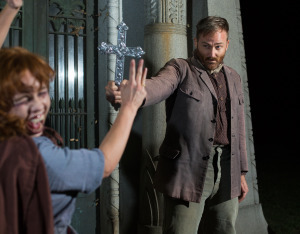 Wicked Lit’s 2014 Halloween show which takes place at the Mountain View Mausoleum and Cemetery in Altadena, California, is just about as creative and unusual as any Halloween event or attraction we’ve ever visited. By no means a “traditional” Halloween show, Wicked Lit offers a highly-immersive theatrical experience that is both beautiful and haunting. Formed in 2009 as an off-shoot of Unbound Productions, Wicked Lit is a theatrical group that adapts classic horror literature into dynamic, highly-engaging productions. Usually, these performances are held in and around cemeteries. In 2013, Wicked Lit appeared at ScareLA, where they performed their version of Edgar Allan Poe’s classic, The Tell-Tale Heart, which was a major hit with our convention guests. After seeing the group at ScareLA, we knew that sooner than later, we’d be seeing one of their full-length productions. That moment came this Halloween season, and wow – what an amazing experience we had! Schussler Creative, specialists in the creation and consultation of attractions, restaurants, retail stores and entertainment venues worldwide, today announced their latest project: The BOATHOUSE: Great Food, Waterfront Dining, Dream Boats – located at Disney Springs at Walt Disney World Resort in Lake Buena Vista, Fla. Schussler Creative also is the creator of other restaurant/retail attractions at Walt Disney World Resort including Rainforest Cafe and T-REX Cafe (located at Downtown Disney), and Rainforest Cafe and Yak & Yeti (located at Disney’s Animal Kingdom theme park). 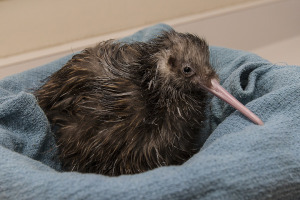 After undergoing a 78-day incubation, one of the longest of all birds, a rare kiwi chick hatched last week at the San Diego Zoo’s Avian Propagation Center. Animal care staff made the decision to intervene with the hatching of this newest chick when it didn’t proceed as it should. Unlike most birds, it is the father kiwi that incubates the enormous egg. The female is nearby and will sometimes lay a second egg a few weeks later. When hatching, a kiwi chick typically pokes a ring at the top of the egg with its beak, allowing it to emerge from the top of the egg. This chick accidentally poked its legs through the bottom of the egg, making it difficult to emerge. Staff monitoring the chick carefully taped the bottom of the egg to give the chick the opportunity to hatch on its own, but after the chick was still unsuccessful, keepers peeled back part of the shell to assist with the hatching.